Cotton Pickin est 1983 Phillip 'cotton' Dawson has been trading at the Fremantle markets since 1983. The stall is for all sporting lovers who need to be decked out to look the part. 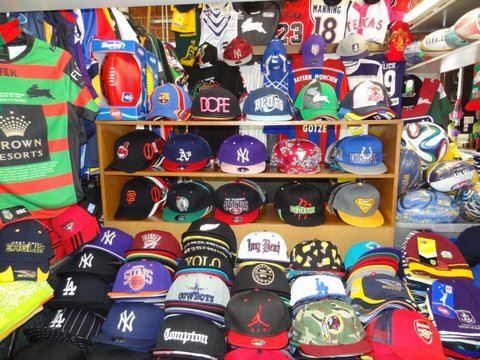 Cotton Pickin sells and specializes in Caps with one of the biggest ranges of Baseball caps in Australia. Cotton Pickin retails Australian Sporting codes of merchandise; AFL, NRL, Rugby Union and Cricket gear. For the American sporting codes with have NFL, MLB, NBA and NHL gear available. Cotton Pickin can also source Throwback Jerseys of old famous sports stars. Soccer/Football fans will find EPL, La Liga and Serie A Jerseys here. Come to the Fremantle Markets or contact Cotton Pickin for the Gear.